We all know Vision is going to play a part in the hugely anticipated sequel to Joss Whedon'sThe Avengers. We've seen concept art and the android's back was facing us in another poster, but now we're finally getting a great look at the final product. It's all thanks to the Instagram user Israel06 because he spotted a brand new banner for the movie and took a picture. As expected, it has several heroes striking a pose, but Vision is the focal point! Maybe they haven't revealed too much about Vision just yet because the android's going to play a pivotal role in the story? Anyway, check out the image. What do you think of the design, Viners? Avengers: Age of Ultron is directed by Joss Whedon and set to open May 1, 2015. Design looks awesome, I hope we continue to not see him in any of the trailers. Would be a cool surprise to see him have many great unspoiled moments. I've never been a fan of the Vision but he looks badass. I don't know that much about Vision, but he looks really good with the rest of the characters, mainly because he looks so out of place among a cadre of humans. I look forward to this! He looks awesome. Iron man too. Did this leak before? I feel as if I've already seen it. @jonny_anonymous: I think there was but not as detail. I forgot he was in the movie. @jonny_anonymous: I've seen it before somewhere as well. Awesome pic! He'll probably look amazing in action on film. Vision looks badass. I am also glad the fixed the Iron Mam look from IM3. I hope they make him strong again. Joss Whedon had a vision and it came true. I love the way Marvel take somthing from the comic and just use it without feeling the need to tweak it or 'improve' it. That is a REALLY good design. Lol so will DC and Marvel now make announcements within the same 24 hour period from now on? That's a cool pic but the hard part will be how to make Vision an interesting character! Still need to see the Vision in motion and how he looks on screen, but so far I likey what I see. They didn't completely alter his appearance and just make him a generic black or silver colored robot? Praise to them! They revealed him quite a while ago. I agree with you so much. 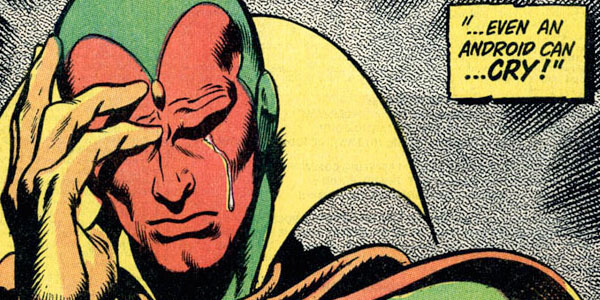 The Vision is a character that I really like but I don't know too much about him besides the basics of his story. He kinda looks if Iron Man was cosplaying as Thor in his armor. Totally agreed, & awesome image of Viz!! Really looking forward to seeing him in action. face looks cool..the body is a little dark but for some reason I get a Man of Steel vibe. They revealed him quiet a while ago.